October 7th will be the next Live Event for World League Wrestling! Make sure to mark it on your calendar, as tickets will go on sale on Monday! There will be a double main event taking place as Kyle Roberts takes on Jayden Fenix in the finals of the 2017 Harley Race Invitational Tournament, as well as Jon Webb defending the WLW Jr. Heavyweight Championship against Orion Creed! 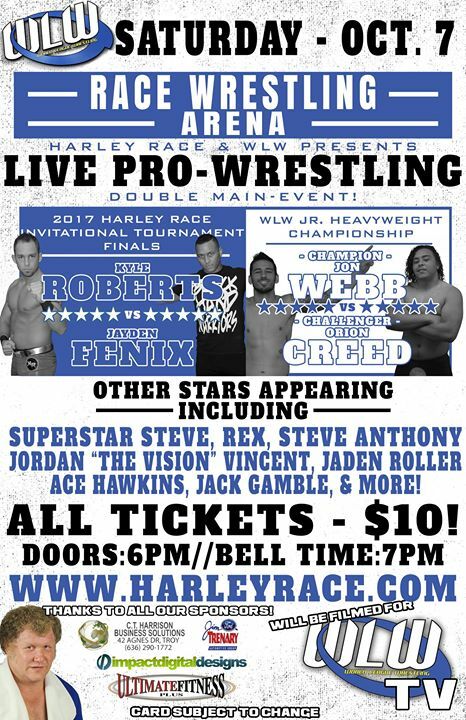 All tickets are $10, and will go on sale at http://www.harleyrace.com next week! Thanks to all of our sponsors here at WLW for working with us in keeping this going – including Ultimate Fitness Plus, C.T. Harrison Business Solutions, Impact Digital Designs and Jim Trenary Ford! This entry was posted on September 18, 2017 at 5:02 pm	and is filed under Uncategorized. You can follow any responses to this entry through the RSS 2.0 feed. You can leave a response, or trackback from your own site.